I'm still carbin' it up over here; I'm covering lost Christmas cookie ground now that I'm home and surrounded by innocent ingredients. 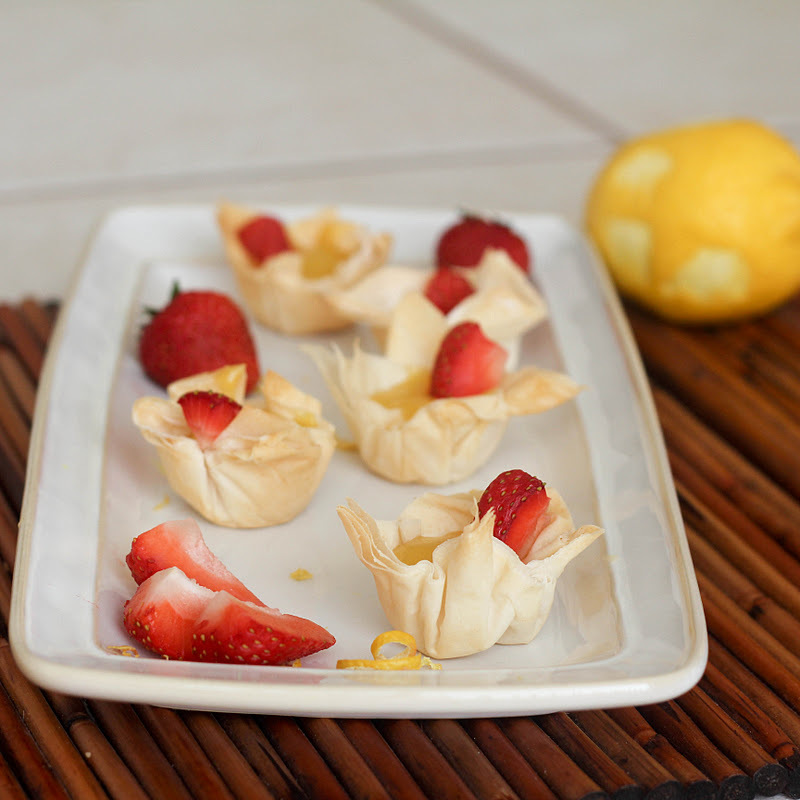 I had this phyllo dough in the freezer; after some searching around for various things I had in mind, I decided to wing in and put together a summery appetizer. I used one roll of phyllo dough (let it thaw first) - I cut it into squares to fit my mini muffin pan. I greased my muffin pan and placed three layers of dough into each cup. I brushed the tops with a bit of butter before placing them in a preheated oven at 350 degrees for about 9 minutes - they should be just golden brown around the edges. One rough of dough easily made 48 mini cups. Then I made lemon curd which I have been known to make before and eat by the spoonful. I added a packed of unflavored gelatin to make it slightly more jello-like, so it would hold it's form. Then I put a spoonful in each cup, topped with a quartered strawberry and proceeded to eat about seventeen of them. At least they're mini versions. The lemon curd can be kept for future consumption in the fridge - ice cream, cookies, cheesecake, by the spoonful. The possibilities are endless.